We spent two nights and one full day in Marfa while we spent a week in West Texas. So, we had one full day to explore this quirky little desert town. Our host in Terlingua had joked about the different sort of people we would find when we got to Marfa. Jokes were made about boots that had never seen a days work in their life and beards from New York City (cue the Pace Picante commercial, New York CIIIIIITY?!). And he was right, Marfa did feel like an artist's oasis in the middle of the vast West Texas desert. There was something incredibly cool about turning neglected gas station buildings into modern art galleries, but there was also an air of pretension that cannot be denied about the art or merchandise inside those beautifully recycled buildings. But True Texas or an artist’s invasion, I loved Marfa! Explore the West Texas desert. Maybe I sound pretentious in my criticism of pretension, or maybe I sound ignorant criticizing art. But pay no mind because I loved, loved, loved our day in Marfa. It's best to visit on a weekend because most restaurants and happenings are only open Friday-Sunday. Because of the timing of our flight out we couldn't make that work. But, we made the best out of our weekday visit. If you're on a West Texas road trip, I'd ideally spend at least 2 full days in Marfa, but unfortunately we didn't have the time. Whether you’re short on time like us or have a few days to spare, here’s what to do in Marfa, Texas. The most iconic accommodation in Marfa is without a doubt El Cosmico. They rent out funky renovated trailers, teepees and perfectly decorated yurts. It's an instagrammer's dream and I am dying to stay there one day. Due to tighter purse strings this trip, I wanted the El Cosmico vibe on a budget so I found this beautiful trailer on Airbnb just outside town. It was more than half the price and equally cool. We spent our nights at our trailer instead of spending money in town, watching the sunset with a bottle of wine all by ourselves in front of our trailer in the desert. There are a lot of quirky vacation homes in Marfa. If you've never used Airbnb, click here for $40 on your first rental. The hip apartments at 105 Lincoln will give you a home away from home feel right in the heart of downtown Marfa. They're stylishly decorated and perfectly located right next to Hotel Paisano, the courthouse and all the best shops and cafes. Check availability here. We woke up early and well-rested. There's something about the quiet and clean air of the country that makes sleep feel so much deeper than when I'm in the city. We started the morning with a light breakfast (light was key after so many roadside taco pit-stops on the way here) at Squeeze right across the street from the Courthouse downtown. We got some Müesli and Yogurt, "very European" I commented. Well yes they said, the owner is Swiss and the family owns a Swiss Chocolate factory, the product of which they sell in the shop. YES, PLEASE. Boyz 2 Men - I had heard of their breakfast tacos and was dying to try them but unfortunately they were closed. They're open Friday-Sunday, so next time it is. After breakfast, we went to see the Courthouse and the panoramic view it offers of the town and surrounding countryside. However, we were thwarted by construction. The interior of this 1886 courthouse is still worth a look, view or not. Whatever reforms were underway, I’m sure they’re finished by now so definitely try catching this view. This is when we noticed that the entire town was apparently still asleep. Nothing was open, no one was in the streets. Cursed early bird genes of mine! I decided what better time than now to drive the 20 minutes out of town to see the Prada Marfa art installation (that is actually not in Marfa but in Valentine). The installation was built in 2005 with the plan to let it naturally degrade back into the natural landscape. Vandals ruined the party (as they're wont to do), breaking in and stealing the merchandise. It was repaired back to its original state and the real Prada merchandise inside consists of bottomless purses and only right shoes. It's a fun photo op made even more popular by Beyonce and her golden touch when she spent a few days making the world jealous of her time in Marfa with her Instagram feed. When we got back into Marfa from our Prada outing it seemed to be waking up. People were out and shops were open. We walked through the shops, the art galleries and the Hotel Paisano (which became a regular visit for us throughout the day for an air-conditioned rest stop). When we were hungry for lunch we went straight to the Food Shark food truck. This truck produced the best meal I had the whole trip! I ordered a falafel wrap with bacon, jalapenos, and pickles. Martin ordered lamb and a couple melon agua frescas. Incredible quality for a great price but bring cash, no credit cards accepted. Across the street from Food Shark is Moonlight Gemstones. This was the highlight of my day. Paul Greybeal is the owner and silversmith who will create custom jewelry with the stones he sells in his shop. He specializes in agates that formed in the region due to volcanic activity millions of years ago. I picked out a guitar pick-shaped agate and flipped through his photo albums of past work to choose a design, then I chose a band and he made my custom ring that very day! He rushed to make it for me in time, since we were leaving the next morning, But I recommend allowing him more time or having him ship the finished product to you back home. After lunch and designing my enormous dream ring we walked around town a bit more, killing time until our Donald Judd tour. One place we stopped by was the Wrong Store. It was a quirky shop, with art displayed on the walls, and items for sale displayed on a stunning large wooden table in the center of the room. The building originally served as Marfa's first church, and the owner was very friendly. The items for sale are off the wall, ranging from carved boxes and embroidered vintage shirts to beautiful jewelry. At 4:30 we arrived for our tour of The Block: Donald Judd's home and studio. There are tours of other spaces and expositions of his as well, each costing a lovely $25 per person. I don't have much to say, I don't have any photos. I was not into it. But I will say this, my father knows how to weld and could easily re-create any of Donald Judd's pieces, in case I change my mind. Moving along. To end the day we bought a bottle of wine and dinner at the supermarket to bring back to our trailer to enjoy while watching the sunset over Marfa. There are a lot of amazing dining options in town ranging from Vietnamese food to Mexican food, but we wanted a relaxing end to our week in West Texas. The sunset doesn't mark the end of the day in Marfa however. 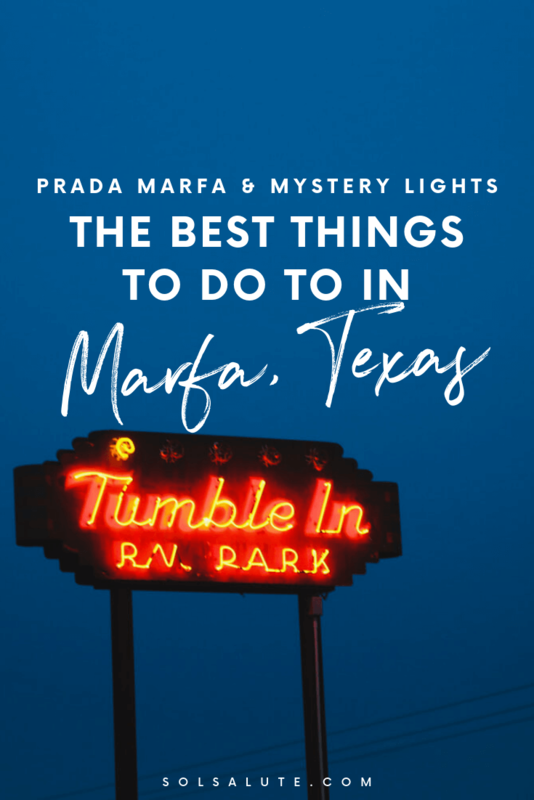 A day in Marfa wouldn't be complete without a visit to the Marfa Lights about 10 miles out of town. We weren't blessed with seeing the inexplicable mystery lights but we were blown away by the stars and the view of the Milky Way above us. After a while of waiting in vain for the Marfa Lights, we took the rest of our wine with us a bit further out of town and pulled over at a safe spot on the side of the road to enjoy the stars. It was a great day in a strange but beautiful little town, and we'll absolutely be back.